Sing&Grow is committed to best practice through research and acknowledges a sector and policy need for more empirical studies exploring the effectiveness of parenting interventions. 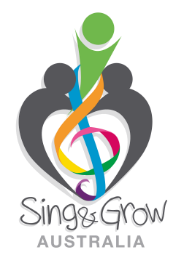 Regular updates will be provided via this website on Sing&Grow research findings to date and more information can be obtained by contacting us. Williams, K. E., Berthelsen, D., Nicholson, J., Walker, S., & Abad, V. (2012). The Effectiveness of a Short-Term Group Music Therapy Intervention for Parents Who Have a Child with a Disability. Journal of music therapy, 49(1), 23-44. Nicholson, J. M., Berthelsen, D., Williams, K. E., & Abad, V. (2010). National Study of an Early Parenting Intervention: Implementation Differences on Parent and Child Outcomes. Parenting Program Implementation. Prevention Science, 11(4), 360-370. Nicholson, J. M., Berthelsen, D., Abad, V., Williams, K., & Bradley, J. (2008). Impact of music therapy to promote positive parenting and child development. Journal of Health Psychology, 13(2), 226-238. From July 2012 – December 2013, Sing&Grow conducted a thorough evaluation of its innovative Community Placement Model (now Community Partnership). 799 families participated in Community Placements within the data collection period and the following summary highlights evaluation impact outcomes of the service. Parents also reported that participation in Sing&Grow had taught them about child development (100%), taught them new parenting strategies (96-99%) and improved their relationship with their child (98%). The Australian Music Therapy Association - Here you will find further definition and information on Music Therapy, its applications and relevant publications and events within the profession. Playgroup Queensland - Sing&Grow is a program of Playgroup Queensland. Visit their website to learn more about their programs designed to promote early years development, build community capacity, and create pathways and opportunities for all families to enjoy the many benefits that a quality play experience offers. Playgroup Australia - The peak body for playgroup associations across Australia. Their vision is that all Australians value the benefits of playgroups to nurture young children, connect families and build communities through play. Raising Children Network - An invaluable website produced by the Parenting Research Centre and the Murdoch Children’s Research Institute (Centre for Community Child Health, Royal Children’s Hospital) to provide information that can help parents with the day-to-day decisions of raising children from infancy to adolescence. Unique Outcomes - Unique Outcomes is a boutique strength-based consulting company specialising in customised learning and change partnerships within the human services.